The tidal flow along the NW coast of Jura always runs SW to NE so we were quite tired by the time we approached Glengarrisdale Bay. We really were in need of a break. There had been nowhere to land as the swell was breaking heavily on the rocks and sending spray high above our heads. 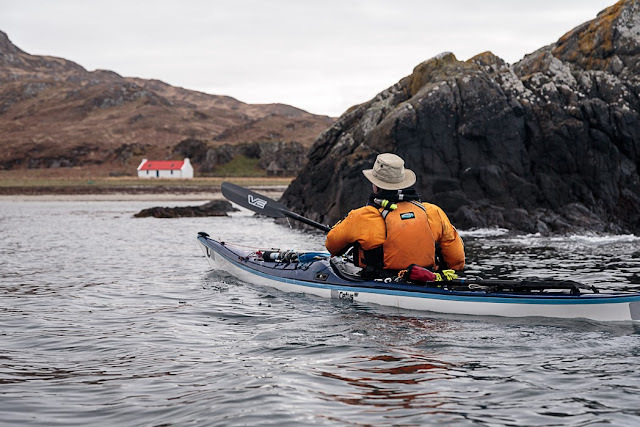 to get some idea of the scale, you can just make out Iasn paddling to the right of the red roofed cottage. 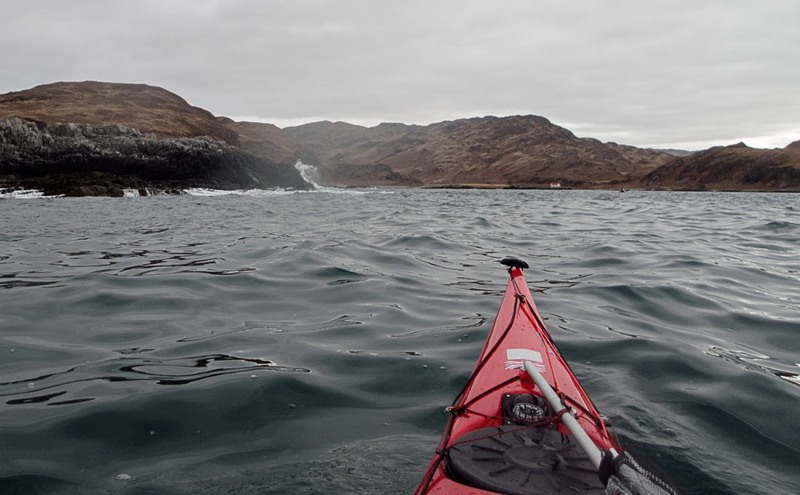 I had no worries about landing at Glengarrisdale as some islands and reefs protect the beach from the swell. Indeed former inhabitants had constructed a seawall of cobbles between the shore and one of the islands. Glengarrisdale Bay was a Maclean stronghold in the mid 17th century. Their stone built fortification, Aros Castle, no longer remains but its site is marked by a solitary tree. The Macleans were defeated here by the Campbells in 1647. 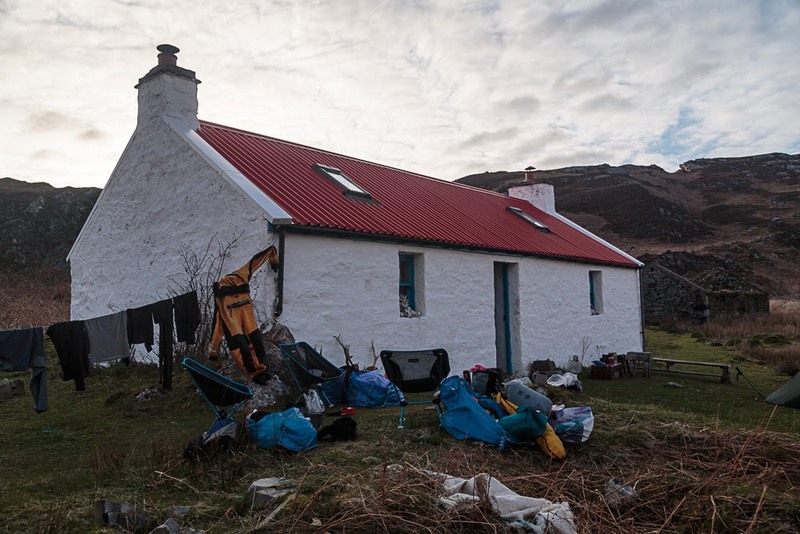 The former shepherd's house was finally abandoned about 1947 and is now a well maintained MBA bothy. 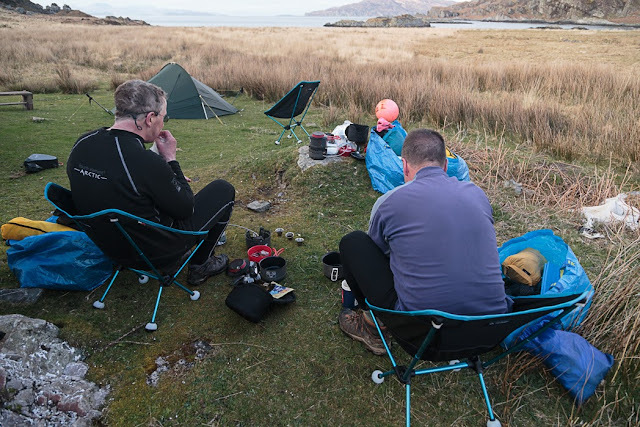 We hoped to spend the night here but as we approached we could see clothing airing on the line and a tent pitched at its front. We feared that it might be full. ...Tom and Frances climbed to the top of the hill behind the bothy to watch the sunset. 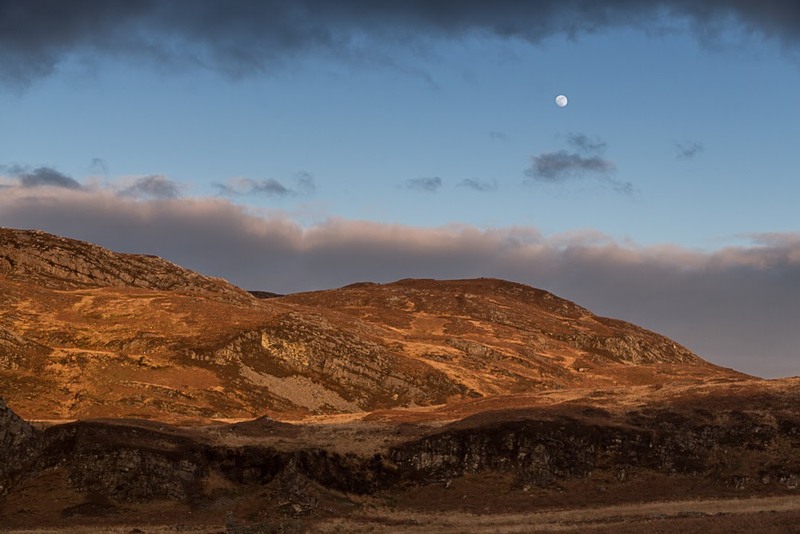 We three were so knackered that we delighted in just watching the sunset from the door of the bothy while a full moon rose high in the sky. ...Maclean's Skull Bay. 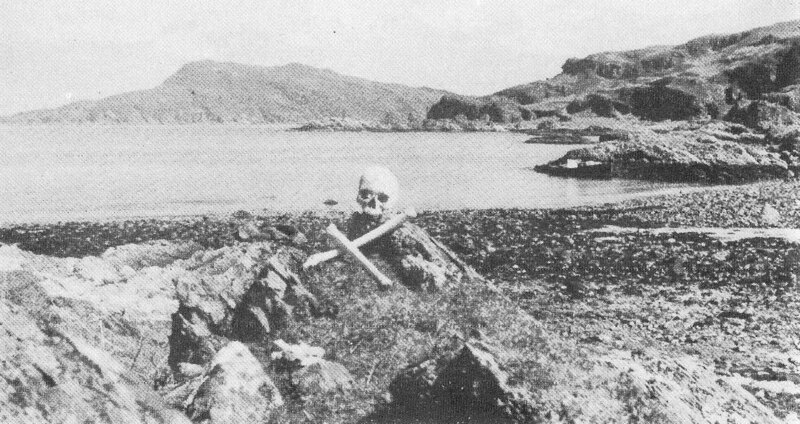 A gruesome skull and femurs sat on a rock at the edge of the bay for many years. They disappeared in the 1970's. The skull had a "sword" cut in it and allegedly belonged to one of the defeated Macleans from the 1647 battle. 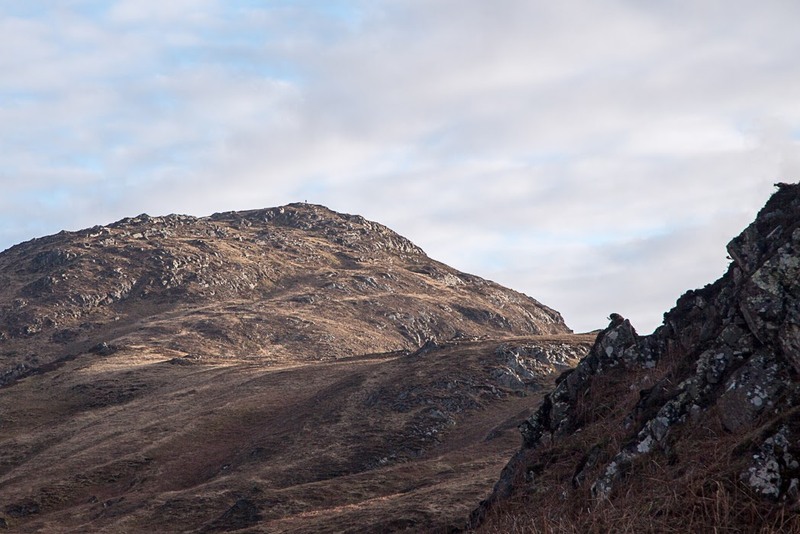 Modern legend says it was situated in Maclean's skull cave at the east of the bay. 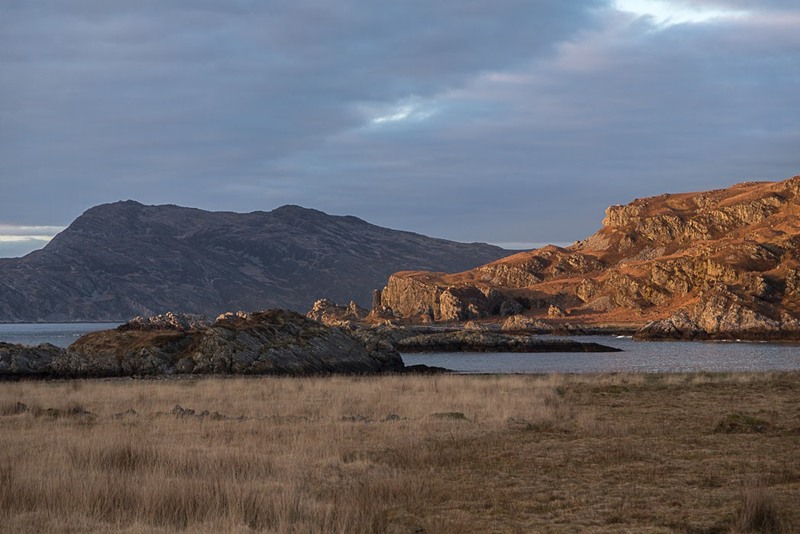 However, in John Mercer's book "Hebridean Islands, Colonsay, Gigha, Jura" published in 1972, the above photo shows the sad relics on a rock at the west end of the bay. Their current whereabouts are unknown. 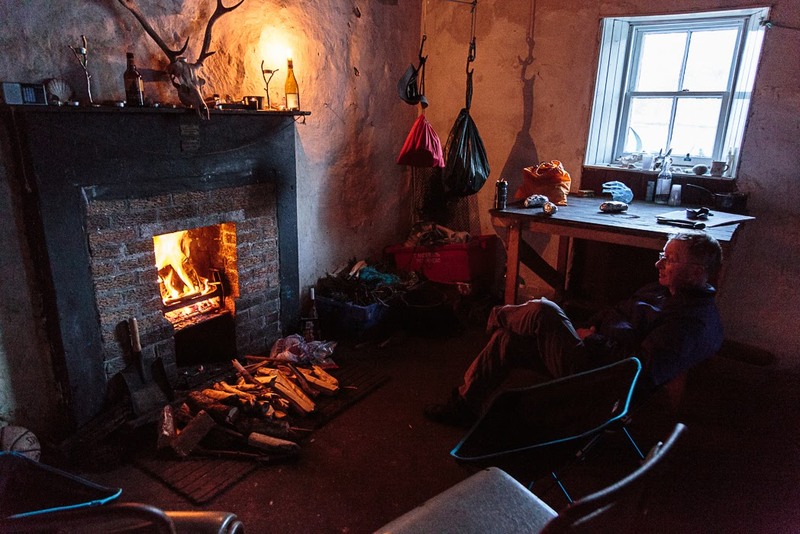 As night fell we got the bothy fire going, We had brought a bag of charcoal some wood and a saw. The estate had left some large logs which we warmed ourselves by sawing. Tom and Frances joined us at the fire and we swapped outdoor tales. 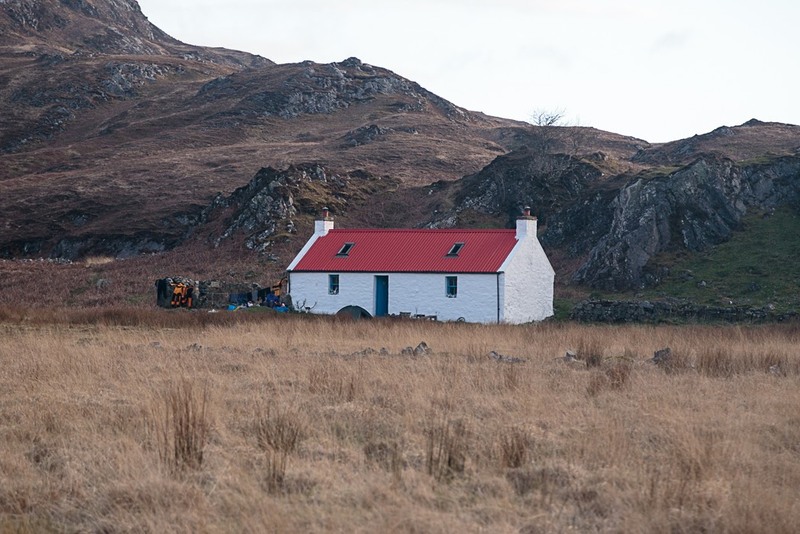 This was their second night at the bothy and both had had a strange dream the night before. Quite independently they had dreamt of men bringing baked potatoes for the fire. It was with some satisfaction that Ian, Mike and I produced sweet potatoes wrapped in tin foil and placed them on the fire, we had plenty to share. Our new friends were amazed! 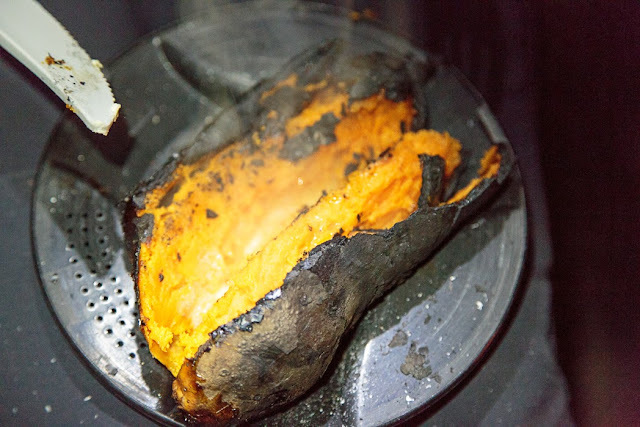 Nothing beats a baked sweet potato with butter and pepper! From that moment on we were known as "the potato men of Glengarrisdale"!